Graduated in 1977 from Glasgow and has been with the practice in Broughton since 1978, becoming a partner in 1982. He was born and brought up on a dairy farm in Northern Ireland. He spends almost half his time on cattle work and maintains a particular interest in cattle fertility; we believe that he has conducted more the 250,000 exams on cows over 35 years. 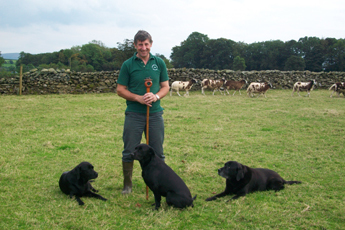 He has become vastly experienced in all cattle, sheep, dog and cat veterinary matters. At home he has his small Jacob sheep flock and breeds his working black labradors, leading to a keen interest in both gundogs and game birds. For the last 15 years, he has been responsible for looking after the zoo animals at Dalton Wild Animal Park and can therefore genuinely say he has expertise in all species from giraffe to guinea pigs! When not doing veterinary work he spends time shooting and working his labradors, gardening and orienteering with regular circuit training sessions and table tennis thrown in to keep him fit.